The Bruins lost to Connecticut 69-61 on March 29. 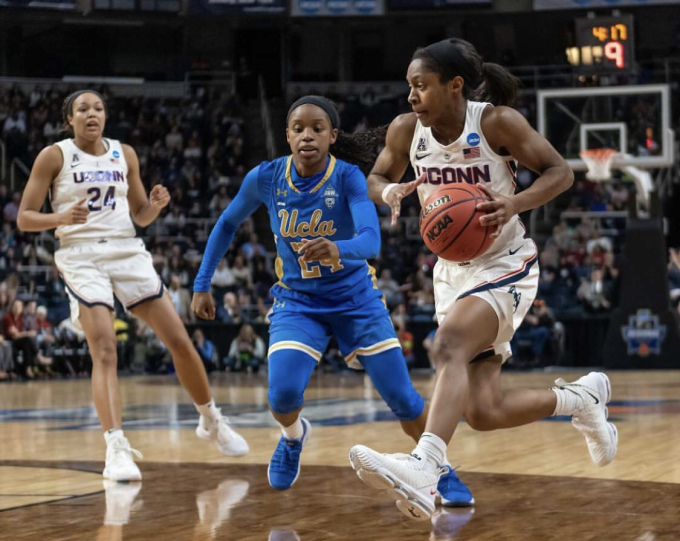 ALBANY, NY—The UCLA Bruins’ women’s basketball team lost against the University of Connecticut 69-61 in the Sweet 16 NCAA tournament on Friday, March 29. A No. 6 seed lost to No. 2 seed, where UCLA jumped out to an early 5-0 lead to start the game, but slowed down at halftime with Connecticut pulling to a 7-0 run. Sparks set the Bruins ahead 13 seconds in the forth quarter until point guard Crystal Dangerfield took a winners shot during the end of the fourth quarter game, advancing the team to the Elite Eight. “Coach is always saying in those moments you can’t be scared to miss. You still have to have confidence in yourself even you’ve gone 0-for-10 even,” said Dangerfield during a press conference after the tournament. She averaged 13.8 points per game. UCLA outscored the Huskies 35-27 in the second and third quarters, defending 19 offensive boards. Poor performance shots hindered the team to keep the lead, sending the momentum in the tournament down 31 percent. UConn will face the winner of No. 1 seeded Louisville and No. 4 seeded Oregon State in the Elite Eight on Sunday at 9 a.m. in Albany, New York.